The guys at The Space Centre initially came to us wanting a video on their home page to spice up their existing web presence. By this point, that website was a number of years old and purely functional, without any kind of style or aesthetics. After an initial consultation and putting our web design and SEO capabilities forward, they decided to bump up the requirement, go all-out and have a complete website redesign, as well the initial requirement for a presenter-led web video. We worked closely with the client to ensure every aspect of theirs requirement are thoroughly investigated. After a number of design submissions, we agreed on a finalised design for the site. We built the website using a Content Management System (CMS) with a view to training the client up to make simple adjustments and update the website themselves. We also integrated the web forms on the site into a database capture system that would efficiently manage all the contacts that came through it. This was important to the client so they could use the database for email marketing at a later date. After the initial consultation with the client about the web design, the client expressed an interest in sprucing up their current logo or providing an alternative. The usual process of ‘consider-create-deliver’ was employed until we could both agree on a final design. The logo concept is based around an overhead view of a room with the door open. The video went through a similar creative process before filming the agreed presenter against greenscreen in a small film studio in south London. We also did a bit of filming in the Kings Cross area and at The Space Centre, which we tied into the final video. We edited the video and added graphics in post-production, using similar shapes, fonts and colours as the new style of the client’s website, ensuring brand continuity between the two. The video was then deployed using an integrated, bespoke Flash video player. Using Flash also enabled us to integrate a web form into the video. The integrated response form we provided in the video captures visitor interest at a point of peak stimulation. We also hosted the video with a very low cost hosting package with dedicated streaming servers across the globe. During the creation of the website, we also built in extra SEO ‘keyword-specific’ pages that would help achieve the natural search results the client desired and have an ongoing online marketing relationship to push for further SEO goals. We were also contracted to provide the client with link-building and article-posting services to ensure their high organic search rankings was maintained in conjunction with their Google Adword campaign. 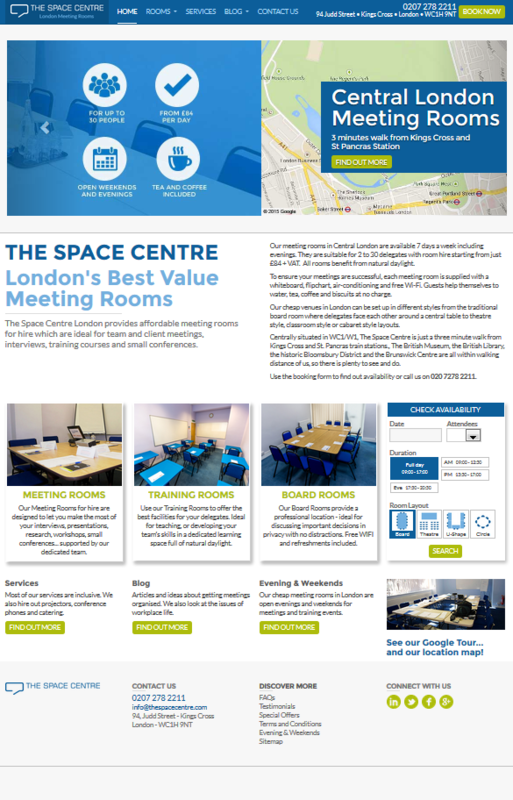 The Space Centre is a family-run business just off Kings Cross WC1, where they offer clients the opportunity to rent out meeting and conference rooms. Because of this, they are continually running GoogleAd campaigns in order to generate extra business through the website. They were so impressed by the website and video we created, they invited us to provide an initial analysis of their existing Adword campaign. We went through the data and agreed we could provide huge cost savings across all the campaigns and that they could be better run. After a very successful meeting between the client and our Adword specialist, the client agreed to a new contract with WebVideos to manage their whole online marketing presence.